Nashik-based Crushing & Screening manufacturer and major exporter of Crusher Box to European manufacturers, Marsman India, plans to enter the demolition waste recycling business. "Though the market of demolition waste recycling is moderate in India, we do see its potential due to the government's emphasis on urban renewal through setting up smart cities. Demand for manufactured sand is also growing so we are promoting our 100 and 300 tph vertical shaft impactors more aggressively, along with our washing solutions that use less water," said Ravi Varma, Managing Director, Marsman India. Marsman has recently introduced its new range of PJC 30"x20", PJC 44"x33",PJC 48"x38" primary jaw crushers and SJC 42"x09" secondary jaw crusher. The new jaw crushers have a more advanced design; they are fitted with hub and sleeve,which makethe withdrawal process easier, and hydraulic systems for setting the jaw plate to get the desired output material. Marsman is also keen to broaden its presence in mobile plants. Said Varma "Our impactor, jaw and screens have been finding a favourable response in India and abroad. 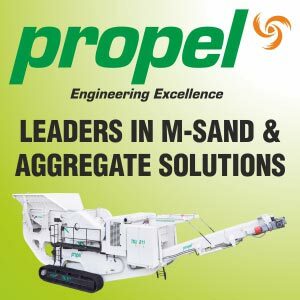 Demand for mobile crushing plants have gone up due to their easy transport from site to site, and a standard designed plant can be erected, commissioned and dismantled in a very short time, which is also a big advantage." Marsman has also been strengthening its customer support initiatives. "The crushing & screening market is highly service-oriented. We have in place a dedicated after-sales and service team of highly skilled engineers who are based in different parts of the country and are just a call away for customers needing any kind of technical trouble-shooting," informed Varma.